The 4424D digital phone is a 24-button digital telephone designed to provide the most common phone functions required to achieve maximum employee productivity and overall value. 24 Programmable call appearance/feature keys with twin lamps. 8 Fixed Feature Keys: Speaker, Mute, Conference, Transfer, Redial, Hold, Volume Up & Down. 4 Display Soft Keys below the Display. 4 Display Navigation Keys, right of the display: Menu, Previous (<), Next (>), & Exit. DSS port to support 2 DSS4450 adjuncts. Auxiliary power required. 2 x 24 character display. Connects to an IP Office DS (Digital Station) port. Note: Only ten 4424D+ telephones are supported on any single IP Office Digital Station 16 or Digital Station 30 Expansion Module. 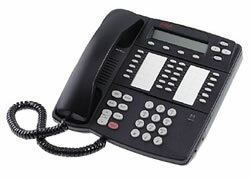 Back to the main Avaya 4400 series digital phone page.